Happy New Year friends! I hope you are all off to a glamorous start to the new year. I’m not sure if it’s the spring catalogs that have started arriving in the mail, or the boredom with my dreary winter wardrobe – but I’m starting to look a bit forward to spring. And I say it’s never to early to start channeling a bit of sun with your wardrobe, so today I’ve rounded up a few of my favorite transitional dresses that brighten your wardrobe. Easy to layer with slouchy sweaters and tights now, and pair with a classic oxford or chunky wedge come March! 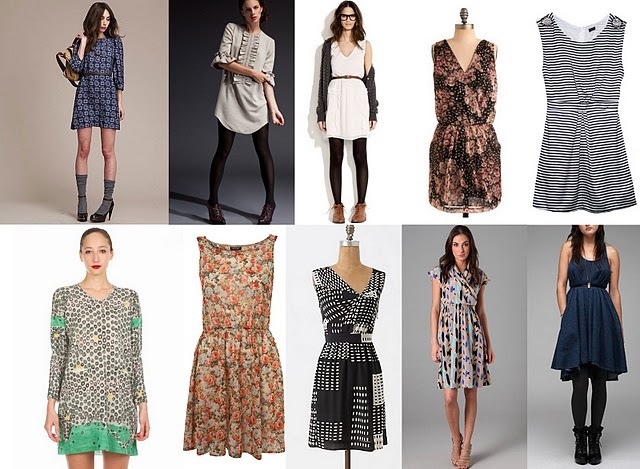 Images clockwise from Top Left: Lauren Moffatt Block Print Dress; Karen Walker Shirt Dress; Madewell’s Chiffon Cascade Dress; Surprise Bouquet Dress; Wren Striped Dress; Denim A-Line Dress; Tucker Cross Front Dress; Antropologie’s Cornellian Dress; Top Shop’s Pink Flower Skirted Dress; Tsumori Chisato’s Floral Tunic.